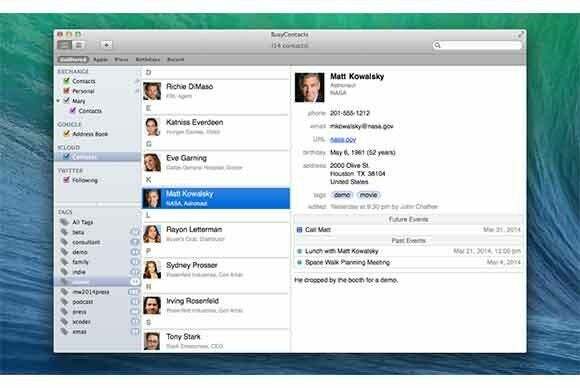 BusyMac Software, maker of the popular BusyCal app for OS X, has announced the upcoming launch of the all-new BusyContacts. The new app is designed to be a complete replacement of OS X’s built-in Contacts app; it features customizable views, the ability to add tags to each contact, as well as smart filters that allow users to quickly find and group entries. Of course, it is also designed to work alongside the company’s calendar-management software, which allows it to keep track of your appointment history with each contact, turning the combination into a personal CRM system of sorts. Sync also features prominently among BusyContacts’ capabilities. According to BusyMac, the software will support all major contact management providers, including Exchange, Google Contacts, iCloud, and generic CardDAV-based services. In addition, the app is designed to play nice with all the major social networks, allowing you to synchronize contacts with Facebook, Twitter, and their brethren. BusyContacts, which requires OS X 10.9 Mavericks, will enter a public beta this summer, and is slated for launch later this year, when it will be available for $50.